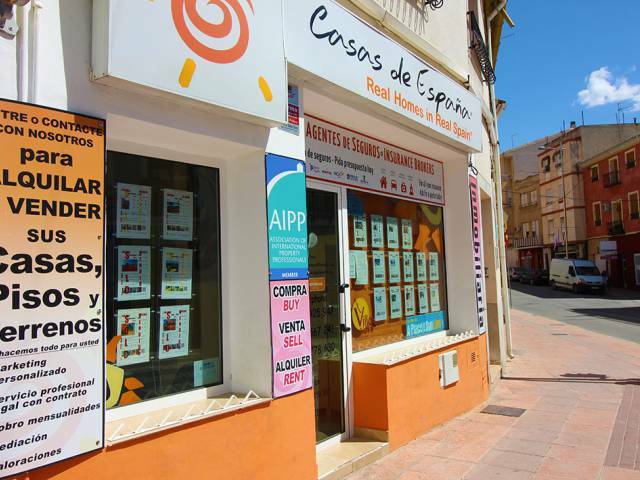 Traditional town house (approx 200m2 including coral), in lovely, close to lake side setting, just minutes from historic Blanca town centre, draped in flowering vines at the front and with a large ladened olive tree in the coral at the rear. Entrance lounge with feature open fire place and original built in alcove store cupboard, leading to additional reception room, original staircase to large bedroom with charming Juliet balcony, original floor tiles, large store cupboard, feature archway and hall leading to further bedroom with access door out into the walled coral area which could either be converted into additional living space or cleared and converted into a lovely garden terrace with loads of space for BBQ, outside kitchen, sunbathing terrace, palms, plants & flowers. Whilst this is a total restoration project, by retaining some original features this property could become a wonderful character place in the sun with ample inside and outside space and in a great location. Mains water connected, mains electric to re-connect, packed with possibilities, great access just minutes from Blanca town centre.